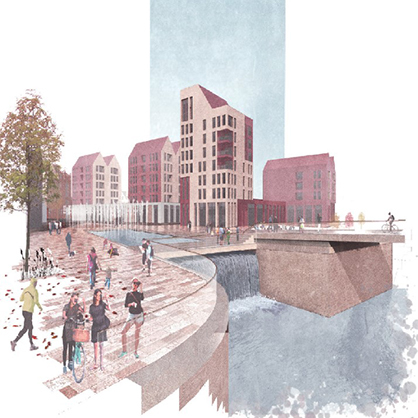 Exciting designs were published on 29 January for the lively and attractive waterfront development to be created at Water Row, Govan. The proposals, which were shaped through a series of community consultations during 2018, will deliver stylish riverside flats and townhouses, together with smart commercial space at prime ground floor locations, all set amongst high quality streets and appealing new public spaces each with a different character to discover and enjoy. The stunning mixed-use development is designed to offer a diverse range of commercial, leisure and community uses that meet local needs and attract new visitors, residents and businesses to Govan. Ranged around and capitalising on the planned Govan-Partick Bridge, the Water Row Masterplan proposals aim to rejuvenate Govan’s waterfront, reconnecting the town centre with the river to create a thriving city destination of unrivalled heritage, character and quality that is distinctly Govan for Govan. Find out more and access the full Masterplan report and recent newsletter here.